The world needs heroes. Since the dawn of civilization, societies have told legends of valiant warriors that fought for the forces of good, giving people mythical role models that didn’t have the shortcomings as ordinary humans. Figures like Hercules, Achilles, and Gilgamesh may have had weaknesses, but ultimately they were godlike beings capable of extraordinary feats that inspired people to be better. The Earth is full of liars and cheaters, but heroes show us how to be strong and brave in the face of immorality. The tradition of these myths continues to this day, most prominently in characters that have appeared in long-running properties that have built up extensive mythologies over the years. DC and Marvel’s superheroes, James Bond, the fantasy warriors of Tolkien and his spiritual successors, these characters fulfill an essential cultural task, particularly for the youth that follow their stories. TV shows like Batman: The Animated Series and Justice League brought these heroes into the homes of millions of children, exposing them to a broad array of situations that cultivate empathy and moral values. Any parent would be wise to show their children episodes from these series, which regularly explore themes that are relevant to developing personalities. Heroes are often tested by being lured to the dark side, and sometimes they fight the temptation, but sometimes they succumb. That’s an important aspect of the hero’s journey that is especially relevant to the real world, showing these figures as they become attracted to the behaviors they’ve been fighting to eliminate. It’s something that young readers/viewers/listeners need to hear about, because they need to have an idea in their mind of what to do when they face those kinds of decisions in their own lives. 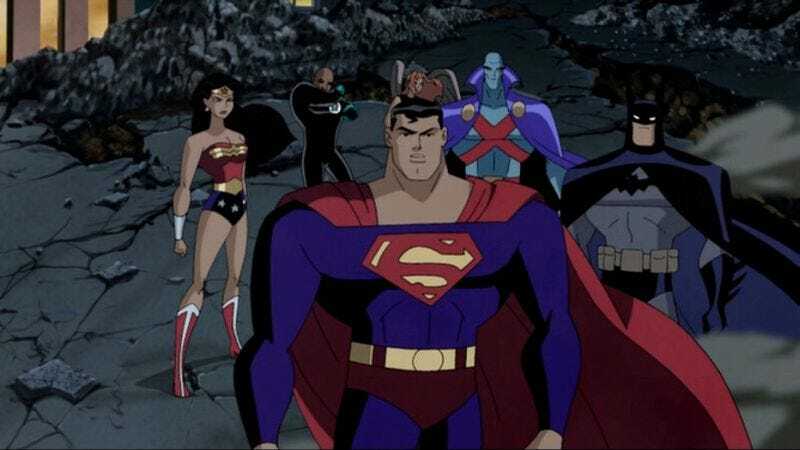 The second season of Justice League Unlimited focused primarily on exploring the possibility of the world’s greatest heroes becoming its worst nightmare, looking at how fear and paranoia can be just as dangerous as superpowered fists and space guns. While the Justice League’s half of the narrative looked at how to use immense strength and influence in a way that didn’t infringe on the rights of others, Cadmus’ half showed the negative consequences of acting aggressively without communicating first. Now both groups have to team up in order to defeat the real threat responsible for all this trouble, and they have to do it on an extremely tight deadline. The majority of “Divided We Fall” is an incredibly choreographed fight sequence between the seven founders of the Justice League, Amanda Waller, and the Lex Luthor/Brainiac hybrid, spotlighting all the reasons why director Joaquim Dos Santos is an integral part of JLU’s success. His anime influence is put front and center as he stages intense aerial battles (pitting the heroes against a wave of tentacles to make it extra Japanese) and a breathtaking super-speed sequence in the second half of the episode, and the intricacy of the storyboards makes the League even more formidable because they’re so gifted in action. Dos Santos also makes excellent use of focus to bring depth to each image, and understands the value of keeping the frame still to show extended action beats. Years before Joss Whedon’s The Avengers set a new standard for choreographing live superhero action, Joaquim Dos Santos was utilizing similar techniques to create fight scenes that were even more dynamic because animation allows for exaggeration. Nine people fighting means that Dos Santos has a lot to juggle, but everyone gets their moment of badassery in “Divided We Fall”: Amanda Waller opens fire on Lexiac during one of his many moments of supervillain posturing, J’onn is the first one to break free when the villain subdues the team, Green Lantern and Hawkgirl get to relieve some of their personal tensions by taking out cybernetic Justice Lords versions of each other, Batman shows the power of agility and exploding Batarangs, and Wonder Woman saves Superman when he has a crippling crisis of conscience. As foreshadowed since the Justice Lords first came to Earth, Superman and Flash end up being the major players in this episode (a nice way of making up for the fact that Flash is absent from the first season of JLU), and writer Dwayne McDuffie is able to build a lot of suspense by taking advantage of what the viewers are expecting. Both the Justice Lords’ alternate universe and DC’s comic-book history have shown that the death of a Flash is a very real possibility, so when it looks like Lexiac is about to empty a shotgun into the speedster, it’s easy to believe that’s the episode’s direction. McDuffie is expecting the audience to underestimate Flash just like everyone else, so when he lets loose and shows the full extent of his power, it’s a breathtaking surprise. Traveling the fastest he’s ever gone, Flash defeats Lexiac by running around the world to speed up his punches, then picking all the circuitry out of Lex so quickly that Brainiac can’t repair the damage. Unfortunately, Wally’s body can’t handle all that speed, and he fades into the Speed Force, the alternate dimension that is the source of his power. For a second it seems like Flash is really going to die (or at least disappear from the series), but J’onn’s telepathy and the team’s superhero arm muscles pull through to bring Wally back from the brink. Some may gripe about a resolution that basically amounts to everyone holding hands to save the day, but let’s not forget that at the end of the day this is a kids’ show, and kids’ shows love preaching the power of friendship. The original seven are more than just teammates, they’re friends and family, and that bond is strong enough to reach through dimensions to rescue one of their own. That bond is what inspires the world to believe in the power of good, and after the Cadmus fiasco, their example needs to continue on. I’m guilty. We’re guilty of the sin of hubris. We had the best of intentions to be Earth’s guardians, to keep you safe, but we failed you. We looked down at the world from our tower in the sky, and let our power and responsibility separate us from the very people we were supposed to protect. No one should ever be afraid of us. Superman makes some valid points, but he’s allowed himself to believe the false claims that have just caused all this destruction. He can’t help but blame himself for the actions of Cadmus because that’s what Superman does: he takes the burden so others don’t have to. He’ll take the entire Earth’s burden because he knows he has the strength to carry it. Thankfully, there are people like Green Arrow around to set Superman straight. “If you’re quitting because you think you’ve already done your fair share, fine, we’ll throw you a parade,” Ollie says. “But if you’re quitting because it’s easier than continuing the fight, then you’re not the heroes we all thought you were.” Green Arrow is the hero that has been most outspoken about the League’s behavior, so if he’s giving Superman approval to keep pushing ahead, then it’s definitely the right course of action. There will be changes to how the team functions and how its power is utilized, but the Justice League will continue to live on. 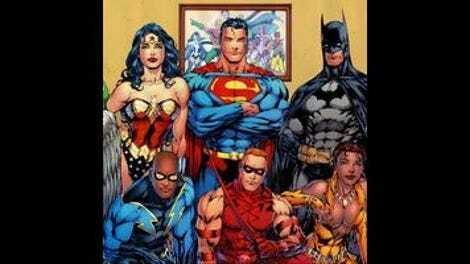 The world will always need heroes, and they don’t get much greater than the men and women of the Justice League. I really like the design of Justice Lords Shayera. It’s very sleek and has a lot of attitude. I don’t think we ever see it again. While I understand why this episode focuses on the original seven Justice Leaguers, I really want to see the entire team beat the hell out of Lexiac. McDuffie makes the smart choice, but the fanboy in me wants to see a big event like this end with an insane fight with fifty superheroes working together. The detail of the crowd at the press conference always catches me off-guard. Everyone looks like they’re drawn by Mike Mignola, with roughly defined bodies and foggy faces, but each person is distinctly rendered. It’s very impressive.